They were strangers who met on a bus. They believe God brought them together. Shobha Warrier reports on an incredible story of kindness and giving from Kerala. Here is an unusual story of two people from different faiths and different places with the hand of God uniting them in a bus. And this chance meeting is going to change both their lives. 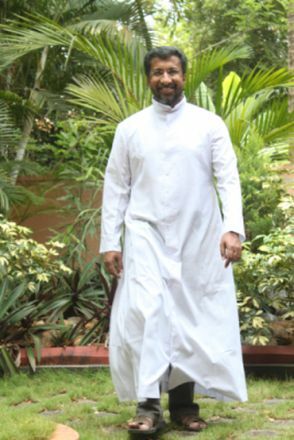 Father Sebastian is a 41-year-old Catholic priest from Kottayam, presently stationed at Chalakkudy. Rasad Mohammed is a 30-year-old from Alappuzha urgently in need of a kidney transplant. Father Sebastian and Rasad, both strong believers in their faiths were sitting next to each other in a Kerala State Transport Corporation bus on their way to Kochi and that was when the priest offered to donate one of his kidneys to the young Muslim man. It was as if God Himself appeared in front of the young man in the form of the priest and blessed him with a new life. Father Sebastian grew up in a very religious Catholic family with his parents encouraging him and his brothers to attend mass every Sunday. He grew up seeing how priests helped others, and slowly was attracted to it without him realising it. When he was a very small boy itself, his only elder sister had joined the nunnery. Though he was a topper in school and in the district, he chose to be a priest. "From when I can remember, I have been drawn to the life of a priest. In school, when teachers asked us who we wanted to become, I always answered, a priest. May be my frequent visits to the church and my only sister becoming a nun had an impact on my decision," says Father Sebastian of his school life. He also admits that there was a period in his life when he was confused about life and what he wanted to be. There was a small desire in a corner of his mind to be an engineer but eventually after the 10th standard, he joined the seminary, and finished his college education in theology and philosophy. He became a priest 13 years ago and in his large extended family of 350 members, he became the first member to be a priest. He is one priest whose eyes well up when he sees someone crying or in pain. "It is difficult for me to say the prayers where there is a death. When I see the family members crying, I also get tears in my eyes. So, I try not to look at them lest I find it difficult to carry on with the prayers." Like almost all young men growing up in Kerala, Rasad also had the dream of going to the 'Gulf' as early as possible. He did go to the 'Gulf' soon after completing his 12th standard in 2008, and worked in a shop as a sales person. His remittance from there was a big boon to his father who was running a small stationery shop at Haripad in Alappuzha. As both his parents suffered from ill health, it was his work that helped them tide over the difficult times. His 21-year-old younger brother also has a small job now in Haripad. One fine day, a year-and-a-half ago, Rasad found his eyesight waning and in no time, he became blind in both his eyes. Doctors found that the problem did not lie with his eyes but with his kidney. He was sent back home by his friends and after undergoing dialysis a few times, he got his sight back, but was shocked to hear from the doctors that both his kidneys had stopped functioning and he needed a transplant urgently. From then on, Rasad has been borrowing money from his relatives and friends for dialysis. "When I first came to know that I needed a kidney transplant, I was quite appalled and then I felt dejected. As both my parents are old, diabetic and suffer from heart disease, they could not donate their kidneys. My brother's blood group does not match." To add to the woes, an agent disappeared with two-and-a-half lakh rupees promising to arrange a kidney for them. "I need frequent dialysis and I am alive only because of the help we are getting from our friends and relatives." Rasad will never forget the day, February 25 in his life. That was the day Rasad boarded a bus at Alwaye to go to the hospital. He had come down from Haripad and was staying at his aunt's house at Perumbavoor. He sat next to Father Sebastian in the bus, by chance. Years ago when Father Sebastian came to know that a person could live with just one kidney, he had decided that he was going to donate one of his kidneys to a very deserving person. "I was also inspired by the story of Father Davis Chiramel, who had donated one of his kidneys to a Hindu. I was waiting for the day when I could also make the same sacrifice." That day turned out to be February 25, 2013. Father Sebastian, who had been attending meditation classes at the Divine Meditation Centre at Chalakudy for six months, was on his way to Kochi in a bus. "A very sickly looking young man got into the bus at Aluva and sat next to me. On seeing his troubled face, I asked him what his sorrow was. He told me that he was a "kidney patient". I found out that his blood group also matched mine." Father Sebastian felt God had given him an opportunity to fulfil his wish. Without even thinking twice, he told the young man, 'If everything matches, you can take my kidney." "I took the decision on the spur of the moment. He stared at me in disbelief for a few seconds. What I also saw in his eyes was renewed hope. Here was a young man who saw only a full stop in front of him and my words added a few more full stops in front of him, and gave a new hope, a new hope for life." In fact, it was like a dream-come-true for Rasad. He could get over his disbelief only when Father Sebastian called him the very next day and asked him to meet the doctor together with him immediately. He also asked the doctor to do all the tests without any delay so that everything was done fast. By March end, all the tests were done, and Father Sebastian was told by the doctors that he could donate his kidney to Rasad. "I was told by the doctors that generally even from within the family, the match of items is only around 65 percent but in our case, it is 95 percent," Father Sebastian said. Once the medical council formally approves the procedure, the transplant will take place and it will most probably be by mid-May. In the meantime, Rasad's relatives and friends are in the process of collecting the money needed for the surgery, which may be around Rs 5 lakh for the surgery alone. 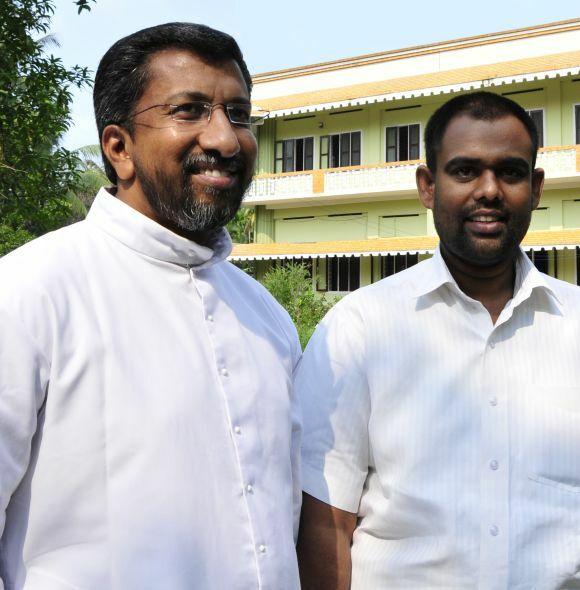 Both Father Sebastian and Rasad see what happened on February 25 as something God ordained. "I am a Catholic priest from Chalakuddy; Rasad, a Muslim from Haripad and we met on a bus to Kochi. What a strange coincidence! Without God deciding it, how can this happen? 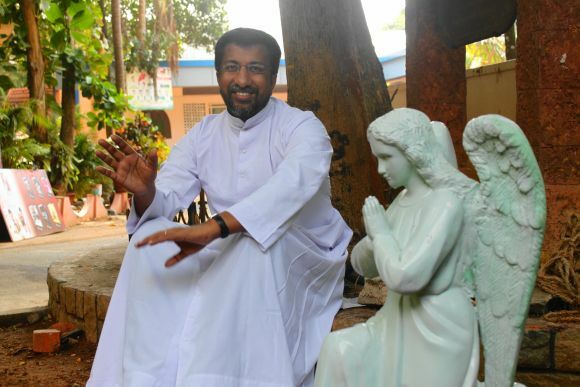 Both of us believe in our respective religions fiercely," Father Sebastian says. He also strongly believes that there is only one God and that God has decided that they meet. "As per my religious beliefs, there is nothing more than giving one's life to someone and God has given me the opportunity to give a part of my life to a person so that he gets a new lease of life. I am talking about what am doing only because I will be blessed if this can inspire at least one other person." Rasad could only say, "What Father Sebastian has given me is another life which I never thought would happen, or at least happen this way." The only message Father Sebastian wants to spread is, "we may be following different faiths but all of us should remember that there is only one God and He represents love and kindness. And in front of death, there is no religion. I sincerely hope nobody will impose their faith on others and nobody would fight in the name of religion. Religion never came to my mind when I wanted to help Rasad; the only thoughts I had were of love, peace, brotherhood and humanism."